This beautiful sign makes a wonderfully romantic addition to the home of a couple who are deeply in love. 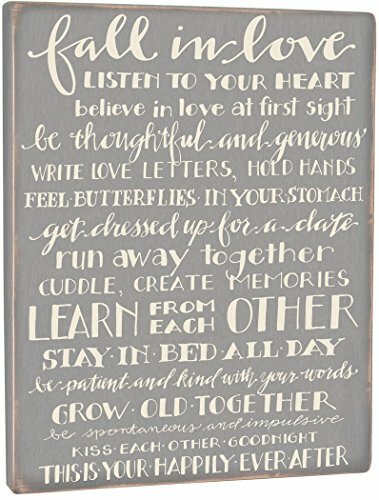 It is filled with romantic wisdom, making it a natural choice for a wedding gift. The cream colored stylized words over the lightly distressed gray background read: "fall in love, LISTEN TO YOUR HEART, believe in love at first sight, be thoughtful and generous, WRITE LOVE LETTERS, HOLD HANDS, FEEL BUTTERFLIES IN YOUR STOMACH, get dressed up for a date, run away together, CUDDLE, CREATE MEMORIES, LEARN FROM EACH OTHER, STAY IN BED ALL DAY, be patient and kind with your words, GROW OLD TOGETHER, be spontaneous and impulsive, KISS EACH OTHER GOODNIGHT, THIS IS YOUR HAPPILY EVER AFTER". The power of these words can truly capture the beauty of romantic love, and will remind over the years of the importance of nurturing that love. It really makes a terrific wedding gift. Made by Primitives by Kathy, this wooden sign measures 35" tall by 26" wide, making it large enough to be prominently featured. Artehouse 0004-8589-32 "Dog is Love - Planked Wood" Wall Decor by Art Licensing - Dean Russo, 31" x 41" x 1"